Ultimate Stackable Caffeine-Free Fat Burner! 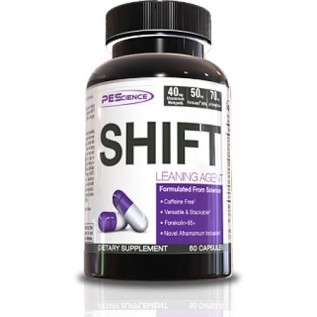 PEScience Shift started out as a thyroid-stimulating slimming agent that was briefly on the market from 2011 to 2012 and then discontinued. We thought it was gone for good, but it turns out PES just very quietly took it back to the lab for reformulation. Then they surprised us all with teasers out of nowhere in April 2015, followed by an almost immediate product launch! The main successor of the old version of Shift was Alpha-T2, a thyroid stimulant designed to speed the metabolism and promote fat burn. Alpha-T2 was actually a proprietary blend that was then sold on its own for a while. PEScience has gone full “open label” with this new formula, giving us the scoop on not only every ingredient, but exactly what the dosage is for each! Citrus Aurantium Extract (30% p-synephrine) (234mg): Whether you agree with it or not (and we tend not to), ephedra got jerked by the FDA and is currently very hard to find in fat burners. Citrus auranium, probably more recognizably titled as bitter orange extract, has become the new core component of choice thanks to its similar effects. Studies have shown it to improve energy, increase fat oxidation and decrease appetite in overweight participants. Rhodiola Rosea Root Extract (200mg): Acute rhodiola rosea intake has shown great promise in young and healthy patients in some studies, improving endurance exercise capacity when taken over a four-week period in one particular study. Hemerocallis Fulva (Flower) Extract (200mg): This brand-new extract has been used in cooking throughout Asia for centuries now, but drew the interest of supplement manufacturers when a 2009 study showed that it activated lipolysis in rats. Coleus Forskohlii (Root) Extract (50mg): Better known as forskolin, this has really become one of our favorite fat burner ingredients around here over the past year or so. It’s had a number of studies with obese populations that have shown improved fat loss when paired with exercise versus a placebo group. Interesting note: PES claims this to be the “most proven stimulant-free fat loss ingredient on the market”, and we really couldn’t disagree here. It’s about the forskolin extract! The key, however, is that you need to get properly-extracted forskolin. Most other companies use 50% extracts. This is a whopping 95% extract – so most of your 50mg here is actually going towards fat burning, not other parts of the plant that are less effective! Olive Leaf Extract (200mg): The main item of interest in olive leaf extract is oleuropein, which is central to all the various health benefits found in olive oil. It’s in fat burners due to some studies indicating that it activates lipolysis, however. Aframomum Melegueta Seed Extract (40mg): More commonly seen around other supplements as “Grains of Paradise”, this extract comes from the ginger family and was shown in a 2014 study to activate brown adipose tissue in non-obese patients. Most users report feeling some great heat from grains of paradise, almost similar to the feeling you get from capsaicin-based supplements (capsaicin is the extract from red hot peppers, but gives more heartburn, which we prefer to avoid here).